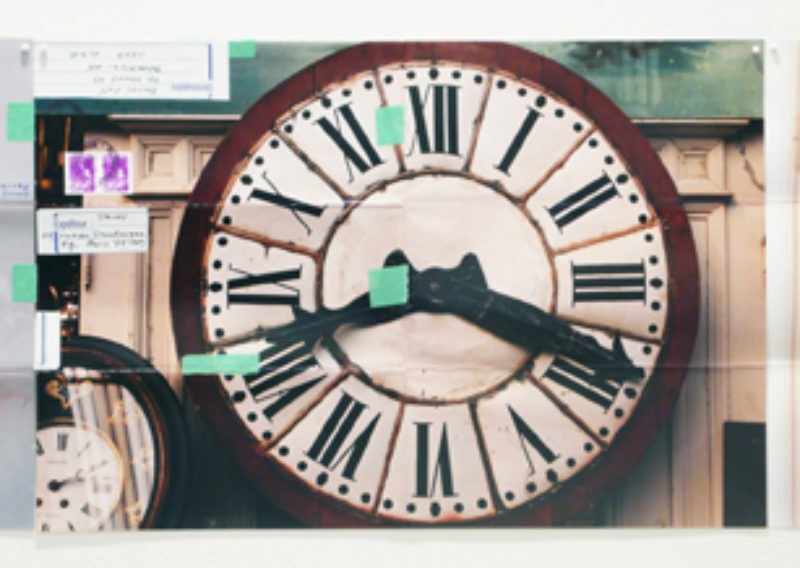 ‘As time goes by, this clock, especially, becomes a luxury it is difficult to do without.’ Written by Walter Benjamin in a letter to his friend Gershom Scholem, this enigmatic statement provides the marrow for Moyra Davey’s new video ‘My Necropolis’–a work that shares its title with Davey’s latest exhibition. The moribund 32-minute video features interviews with the artist’s peers as they attempt to pick apart the letter’s intention. Is the clock literally a luxury or does the clock serve as a metaphor for time? Davey’s friends and family toil over the passage. The events of Benjamin’s life in 1931 become a topic of discussion. Jason Simon posits that Benjamin could be making a joke. As Benjamin has fallen into financial hardship at the time, he asserts that, although his flat doesn’t have a desk to write on, included in his rent is a very luxurious view of a clock. Another astute insight comes from the artist’s son, Barney Simon Davey. Barney states, ‘Time can tell you if you’re late… and knowing is better than not knowing.’ No major consensus is reached, but the act of inquiry itself seems to hold great gratification for the artist. Interspersed with this is Davey’s footage, documenting cemeteries in Paris. The graves of notable French intellectuals: François Truffaut, Marguerite Duras, Gertrude Stein, Jean-Paul Sartre and Simone de Beauvoir all make appearances. Originally titled ‘The Death of the Author’, Davey’s footage of Parisian graveyards was first shown autonomously in the summer of 2009 in an informal film festival organised by Davey and her partner Jason Simon. Taking its title from Barthes’ seminal essay, Davey wryly juxtaposes the ultimate biography – an author’s tombstone–with the sentiment that such information is meaningless. And by pairing the graveyard footage with that of her interviews on Benjamin, the artist illustrates a seemingly futile exercise in the act of reading and deconstruction. Davey appears to revel in coinciding meanings and intentions via her contemporary sounding board and those entombed in decades passed. Here, ‘My Necropolis’, is transformed into an artist’s graveyard. The remainder of the show, meanwhile, comprises of over 200 photographs taken over a period of 20 years, and shares the same effete attitude and builds on Davey’s curiosity for the passage of time. The artist has birthed an incredibly heterogeneous, if humble oeuvre. Foremost a photographer, she is also an accomplished writer. With Simon, Andrea Fraser and Christian Philipp-Müller, Davey is also among the 12 co-founders of New York’s Orchard. Now defunct, Orchard was a collaboratively run exhibition space in Manhattan’s Lower East Side, set up in 2005 with a planned expiration date of three years. Championing alternatives to marketdriven exhibition projects, Orchard became a touchstone for critical exhibition-making in the city. Regardless of Davey’s prowess in the United States, however, she is lessknown outside the country, and has only exhibited lightly in New York, My Necropolis being her first solo show in New York City since 2003. Davey’s practice skips around genres and develops work over extended periods of time. Evidenced here however, much of her work is unified by an inescapable somnambulant feeling; work produced by succumbing to interiority and reflection. One photographic series, ‘Bottle Grid’, 1996–2000, comprises 54 silver gelatin prints depicting emptied gin and whiskey bottles in domestic interiors, while nearby ‘Copperhead’ features detailed, macro images of the faces on one cent coins, and their minute damage. Blown up, the portrait of Abraham Lincoln appears at times unrecognisably battered or else beautifully patinated. Completed in 1990 after the 1989 stock market crash, this latter work posits an ambivalent relationship between the artist’s vision and its economic value. Elsewhere hang photographs of unruly dusty bookshelves, workspaces filled with now antiquated stereo equipment, and stacks of vinyl records. Dust, composed mostly of dead skin, is a metaphor for the futility of housework. When paired, Davey’s images conjure complex domestic issues. For all the consideration in most of the artist’s work, Davey’s use of objects commonly used to cultivate ‘alternative’ identities can appear perplexing. Photographs of vinyl records, empty bottles, and domestic paraphenalia complement neighbouring scenes of tombstones and shots taken out of the Metro window in My Necropolis. At times, Davey seems preoccupied with the arttheory messiah Walter Benjamin for reasons that are as opaque as Benjamin’s letter to Scholem. But even when Davey’s symbolism isn’t entirely convincing, her serpentine, generously personal body of work is. It isn’t difficult to imagine why Davey is considered an artist’s artist – each part of her heterogeneous oeuvre rewardingly influences the other, becoming a sum greater than its parts. The artist’s hyper-perceptive gaze and virtuous patience offers a glimpse into a mode of art making truly at odds with the current cheap-thrill zeitgeist.